"Airports are more than simply points of departure and arrival. They are complex businesses in their own right," said Angela Gittens, director general of Airports Council International World, at this year's Airport Service Quality Awards ceremony. The Future of Airports, published by management consulting firm Oliver Wyman, develops similar observations in its discussion of the entrepreneurial streak that is emerging within the industry. According to the article, airports are becoming equal players in the passenger experience vs. allowing the airlines to "own" the process as in the not-too-distant past. "Non-aviation services, like food and beverage and retail, are a key differentiator, as they have a strong impact on the airport's market positioning and on public perception," note authors Niko Herrmann and Bob Hazel. 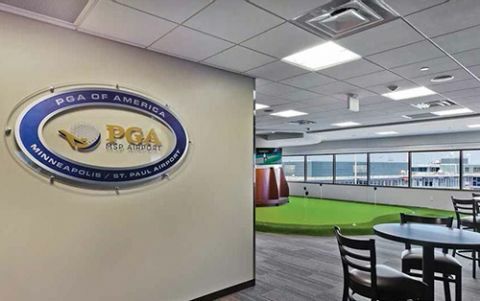 Minneapolis-St. Paul International Airport (MSP) exemplifies this trend with the PGA Experience, a golf-oriented concession that opened in Terminal 1 last March. Described as a "golf lifestyle facility," MSP's new offering encompasses food/beverage and retail elements as well as hands-on services such as simulators and onsite PGA instruction. Access to the lounge, which includes a putting green and "business class" Wi-Fi, costs $10; time on a simulator costs $30 for 30 minutes or $50 for 60 minutes. Prices for the facility's simulated driving range run from $20 for 15 minutes to $35 for 60 minutes; and lessons start at $15 for a 15-minute "tune-up" to $120 for an hour-long session, including simulator time. There is no entry fee for the associated retail store and bar/restaurant. According to developers, MSP's "indoor golf experience" is the first and only facility of its kind at a U.S. airport. The new 12,000-square-foot concession was nearly six years in the making, beginning with a general request for proposals from the Metropolitan Airports Commission in 2009. The original goal was to fill a large area on the mezzanine level of Terminal 1. "We needed a unique concept to drive people up to that level," explains Liz Grzechowiak, assistant director of Concessions and Business Development for the airports commission. Wexford Golf, a local boutique golf services company, submitted the winning proposal; and its president, Joel Burger, teed up a new airport concessions concept. As a PGA professional member, Burger's connections with the organization were instrumental in bringing the strong PGA brand to MSP. Before opening the new golf concession, Burger and MSP had to reconcile a major security issue: Golf clubs are a TSA-prohibited item; and the space available for development was located just inside the airport's screening checkpoint. The Wexford team cleared the potential hazard by developing proprietary technology that satisfied TSA, the Department of Homeland Security and airport officials. "If a golf club gets close to an exit, the doors will lock," Burger explains. The custom security system adequately addressed concerns regarding unnecessary risk for MSP's 35 million annual travelers, and the project proceeded on pace. With the PGA, Wexford Golf and MSP all on board, one more player was needed to make the PGA Experience a reality. The team rounded out its foursome by tapping HMSHost, a mainstay in 114 airports around the globe, to provide industry-specific guidance food and beverages. HMSHost tweaked the menu at Ike's, one of its existing MSP properties, to mimic golf course fare and worked to create a "country club feel" inside the 84-seat bar/restaurant. Michael Price, vice president of Business Development for HMSHost, notes that it was important to align food options with the golf experience, which includes limited time for snacks and drinks. Price and Derryl Benton, HMSHost's executive vice president, worked with company's culinary team to develop selections with a 10-minute turn-time - the maximum amount of time many courses recommend players take between rounds. Benton, who has witnessed the expansion of numerous concepts and brands in the industry, notes that HMSHost had created several other themed concessions before its golf project at MSP. "Airports are like small cities," he comments, noting that increased TSA regulations leave airport visitors with more time for shopping, eating and drinking after clearing security checkpoints. The continuing trend of airlines cutting inflight meal service further adds to the stream of hungry travelers. Not surprisingly, passengers with layovers are the new facility's primary customers. MSP is a Delta hub with an average dwell time of 90 minutes, explains Grzechowiak. Currently, connecting passengers account for fully 80% of business at the PGA Experience; but that may change. Phoebe Larson, marketing strategist for the Metropolitan Airports Commission, believes the facility could expand its reach by promoting its unique services to local residents as pre-flight entertainment. Customers with no intention of boarding a flight can also patronize the facility. Burger worked with TSA to allow non-ticketed airport visitors to enjoy the PGA Experience. Non-traveling patrons simply call the facility 24 hours in advance and provide their name, birthdate and arrival time to receive a special pass that gets them through the security checkpoint. In coming months, the PGA Experience plans to begin co-marketing the 2016 Ryder Cup, which will be played at Hazeltine National Golf Club in Chaska, MN. Interest in the popular U.S. vs. Europe competition is expected to bring even more traffic into the MSP facility, which is already selling a variety of merchandise bearing the distinctive Ryder Cup logo. Despite its notably cold weather, MSP is actually a logical place for a golf-themed concession. Minnesota may be best known as the "land of 10,000 lakes," but it also has a high population of golfers - more per capita than any other state, reports Grzechowiak. If this winter is anything like last year's, travelers can wait out weather-related flight delays at the PGA Experience by hitting balls on its virtual driving range or "playing" one of the world's top courses on a high-tech simulator. Among the dozens of options available, the Old Course at St. Andrews (which recently hosted the British Open) is currently the most popular, reports Burger. Passengers can also shop for new golf wear or even custom-fit clubs without worrying about lugging their purchases onto an aircraft. Clerks will gladly ship merchandise purchased at the PGA Experience.